TAGA will be closed Friday, April 19th and will reopen at our normal time on Monday, April 22nd. We look forward to working with you then. Thank you! 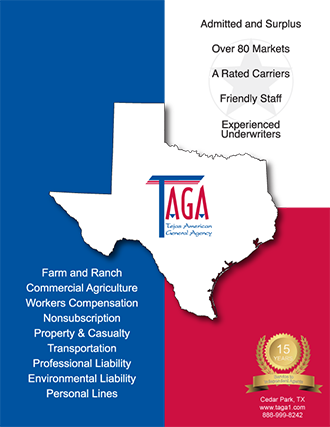 Tejas American General Agency (TAGA) is a Texas based managing general agency (MGA) and Surplus Lines Broker specializing in the commercial insurance industry. TAGA provides prompt and courteous service to match you, our agent, and your insureds with top of the line excess and surplus and standard markets. TAGA underwriters are commercial insurance veterans dedicated to providing you the service you need to be competitive. Our professionally trained customer service representatives ensure your policies and endorsements are handled in a timely and accurate manner.